I do love the holidays, and all that it takes to get ready to share special times with our family and friends. But – it can get really hectic sometimes. And for a lot of people, add in stuff like kids to take care of, a full time job and other obligations – it’s easy to see why so many people just put their heads down and wish for January to get here. 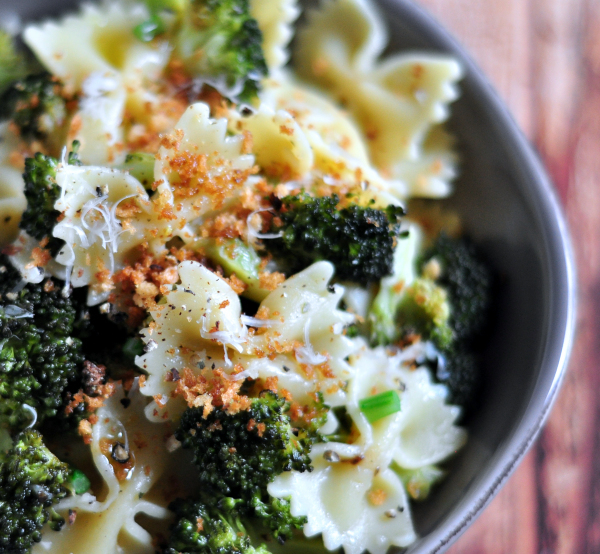 I can’t help you do your shopping or baking, but I might be able to help you with a fast and easy dinner that everyone will love, and is guaranteed not to frazzle your nerves – Bowtie Pasta with Roasted Broccoli! The idea for this came from the fact that when I picked up my food co-op order a few weeks ago, I had a chance to buy a bunch of beautiful local broccoli – even though I had just bought some a few days prior. I wasn’t about to pass that up, and I knew I would be able to find a way to use it. This recipe is so simple and easy, that you could even have your kids do it – with a bit of supervision in the using of the stove and oven. Fresh broccoli roasts up with oil and garlic while the pasta cooks, and then, the two are combined with a little more oil, salt & pepper, a sprinkle of Parmesan or Romano cheese, and a finish of toasted breads crumbs if you like. 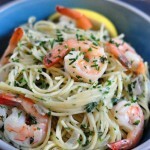 Fresh, easy, delicious – a perfect weeknight meal on a busy evening. Fill a 3 quart saucepan ⅔ with water, add a good big pinch of salt, and place over a high flame. 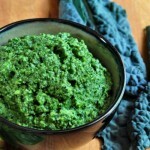 Wash broccoli, shake to get rid of excess moisture, and cut into florets - about 1 to 1 & ½ inch pieces. Pile the broccoli in the center of a heavy, parchment lined baking sheet, and drizzle with half of the oil and the salt. Toss the broccoli a bit to get it evenly coated in the oil, and spread out in an even layer. Place in the oven, and roast for about a total of 15 minutes, [you'll be adding the garlic at about the 12 minute mark] stirring a few times so that it cooks evenly. If you like your broccoli more cooked, figure on about 20 minutes. While the broccoli is roasting, cook the pasta in the boiling water - check the package for cooking times. When the broccoli has roasted for about 12 minutes, sprinkle the chopped garlic over it, stir, and return the pan to the oven. Reserve ½ cup of the cooking water, and drain the cooked pasta. Place in a large serving bowl. Take the broccoli out of the oven, and pile it on top of the cooked pasta, making sure to scrape out all of the oil and garlic. 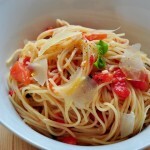 Drizzle over the remaining olive oil and stir, adding a bit of the pasta cooking water to help form a light sauce. Sprinkle the top with some fresh cracked pepper, the cheese if desired, and toasted bread crumbs*. 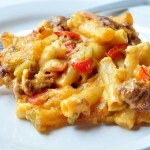 Serve immediately, refrigerate leftovers. Recipe can be doubled. *To make bread crumbs, place two slices of firm white bread in the food processor, and reduce to coarse crumbs. 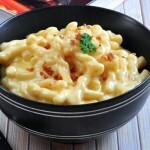 Melt a tablespoon of butter in a small skillet, and toast crumbs until golden brown and crisp. Remove to a small bowl, and set aside until needed. You can change up the veggies to suit your family’s taste – cauliflower, carrots, and shredded brussels sprouts are all really good in this – or try a combination of different vegetables. 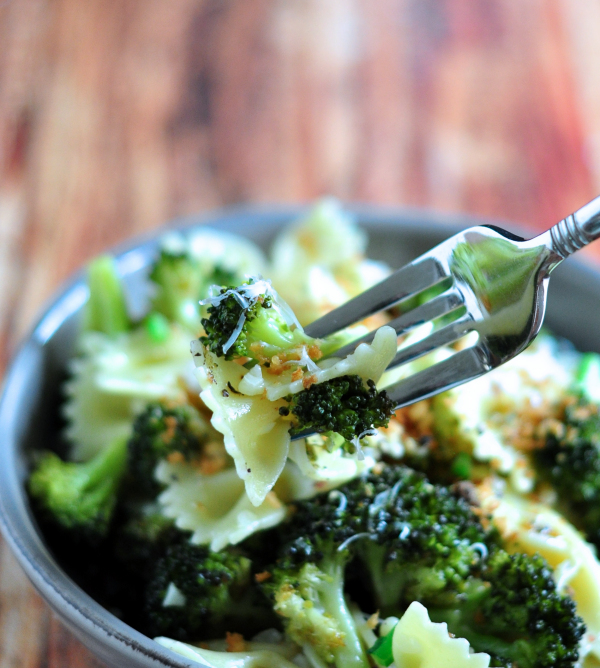 Turn Bowtie Pasta with Roasted Broccoli into a bowtie pasta with your family’s favorite roasted veg. Yum – and frazzle-free! Always looking for a new pasta dish. And love roasted veggies, and broccoli is particularly nice. Plus the combo of broccoli and pasta is terrific. This looks wonderful — thanks. This is a a staple lunch for daughter in the summer. Sounds like a great lunch Amy! Nice and easy, that’s what we need right now.Thank you! I agree Gerlinde – and broccoli is so yummy this time of year! I make a bow tie and broccoli dish for dinner quite frequently—but yours with the roasted broccoli has given me ideas on how to tweak mine! It looks fabulous! With all the heavy rich foods that the holiday brings, this would be such a pleasant diversion. And I’m all for diversions! I know what you mean, Abbe – a perfect rest from the usual holiday stuff! This is so delicious and healthy as well! Another lovely idea, Donalyn. Thank you! The pleasure is mine, Arthelle. ? Ha – I love it when you can show someone they really do like the fresh stuff! 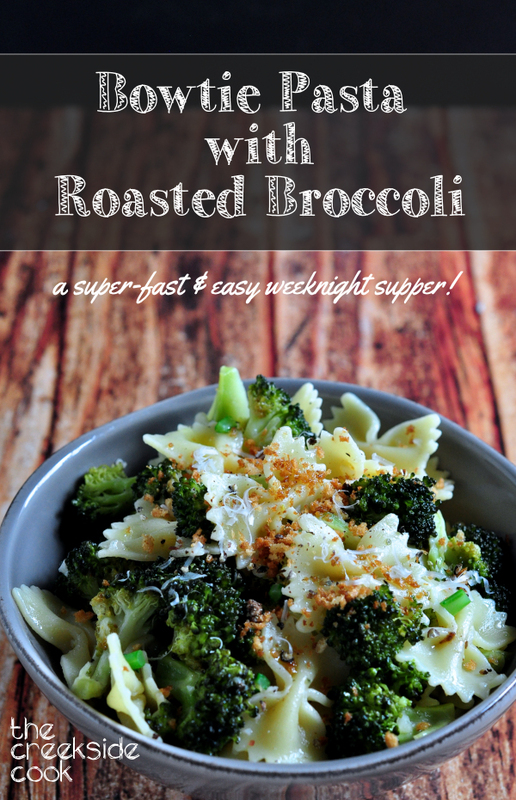 I love the idea of using roasted broccoli in this dish – roasting vegetables always makes them extra delicious! Thanks, Amy. 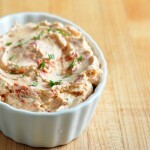 It does make such a difference in the flavor, and it’s super easy.